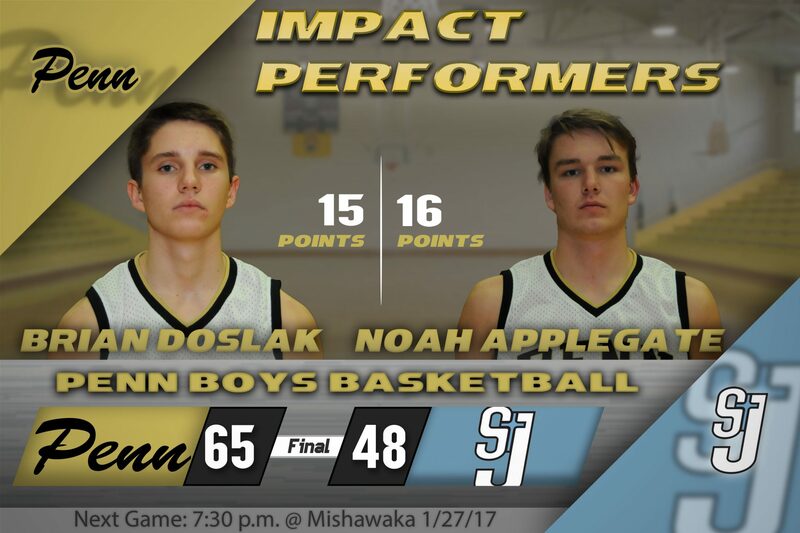 On Friday January 20, the Kingsmen boys basketball team hosted the Indians from Saint Joe in a Northern Indiana Conference clash at Penn. The Kingsmen scored a 65-48 victory, winning their fourth game in a row, and winning their fifth game in their last six contests. Noah Applegate lead the Kingsmen in scoring with 16 points – all in the second half. Brian Doslak followed with a 15 points. Drew Lutz scored 14 points. To start the game, both teams started off by just going 3-of-8 shooting in a low-scoring first quarter in which the Kingsmen led the Indians 11-8. The Kingsmen went on a 7-0 run in the second quarter, but the countered with a 6-0 run, and the Kingsmen owned a 24-20 halftime lead. The teams traded runs again in the third quarter. The Kingsmen went on a 9-0 run, followed by an Indians’ 7-0 run. The Kingsmen led the Indians 37-34 at the end of three quarters. Penn owned the fourth quarter. The Kingsmen went on a 12-0 run and went on to outscore St. Joe 28-14 in the fourth quarter to wrap up the victory. The Kingsmen are now 7-6 overall and 4-2 in NIC play. Penn plays at archrival Mishawaka on Friday, and at Goshen on Saturday.